This year I decided to stop thinking about watching (photographing) the fireworks over the San Francisco Bay and actually get out and do it. One of my good friends and great photographer, Steve was only happy to come along and plan our New Year’s Eve photo excursion. We decided, since we were going to be out in the cold weather we may as well catch the sunset over the city. I had been wanting to revisit my last shoot from the Port of Oakland where I shot my last time lapse of the Bay Bridge lights. This time my focus was to obtain a really good high quality wide panorama shot for large format print and reproduction. I did however capture a time lapse of the sunset and city lights as well. It’s hard not to, as it has become fairly easy for me with my 7D and 17-55mm f/2.8 lens. I’ve shot so many time lapses with that combo, it only takes a few minutes to setup. Magic hour over the city only lasts for a few minutes, and I found it very challenging to capture a full panoramic set of the city with a long enough exposure at a narrow enough aperture (f/8 or smaller). This was due primarily to the amount of the disturbance on the water from boats, ferries and large cargo ships. While you might see a few minutes of calm, they are punctuated by wakes, shadows of moving vessels and light streaks. My frustrations were only compounded by the fact that I decided to use my EF 2x Extender III on the 70-200mm f/2.8. I chose the wrong time to experiment. Under anything other than perfect lighting conditions you will find it exceedingly difficult to use any lens with the 2X extender III. As a result, I missed easily half of my photo opportunities. Below are some panoramic shots I managed to salvage. The detail is pretty impressive – you can see inside offices and hallways in all those buildings you see. The full res compressed JPEG is just under 200MB and the master GIMP file is 1GB (1000MB). We shot through the sunset till about 9pm then we packed up and headed out to treasure island to scout for a good angle on the action. I have never seen this many photographers and enthusiasts in one place. The whole island was crawling with people like me. Even in the seemingly remote bushes along back roads. We finally settled on the waterfront as the best vantage point. Fireworks are a challenge to shoot! This was my first time shooting fireworks and nothing could have prepared me for it. Below is a collection of some of the highlights. Overall I think it was a success. There are a few things I would’ve done differently now. Your feedback would be highly appreciated. I was also able to capture a time lapse of the fireworks. The entire show lasted about 13minutes. It was a spectacular affair. If you missed it, the time lapse compilation below should help you enjoy the experience in a matter of seconds. My new years gift to you. I wish you a Happy and Prosperous New Year! My last stop on Day 1, after Pont Neuf and Pont des Arts, was Le Louvre. I had stopped by earlier in the day but found there to be just too many tourists and visitors to even get a half decent shot. My photographer instincts are always to come back and revisit my subject at a time most would consider obsessive or outright insane. Depending on how far I am willing to go, I may often find myself to be the only one around. It was past 1:00am when I arrived at The Louvre. The square/plaza was gated-off but as I approached I found a small opening and walked through. Aside from a few men at the doors of the pyramid, I was the only one around. As I later on realized, they must have been part of a maintenance crew because the Louvre would be completely dark by this time every single time I tried to revisit it at night. This, as I found out, was due to budget cuts in the city of Paris or as the Parisians called it, “La Crise Economique” (The Economic Crisis). So I sort of lucked out on this night. Apart from one-or-two couples in “love” who were stopping by to take in the night lights, I was all alone. I had the entire Louvre to myself. It was so tranquil and relaxing. I took my time to soak it all in and plan my shots well. I wish I had a tilt-shift lens with me to help make the panoramic stitches less painful and more seamless. I whould also have liked to do some HDR time lapses of my shots, as the overcast skies would have provided for a great dramatic background but all I had with me was my 5D Mark III, 24-105L lens and some ND filters. 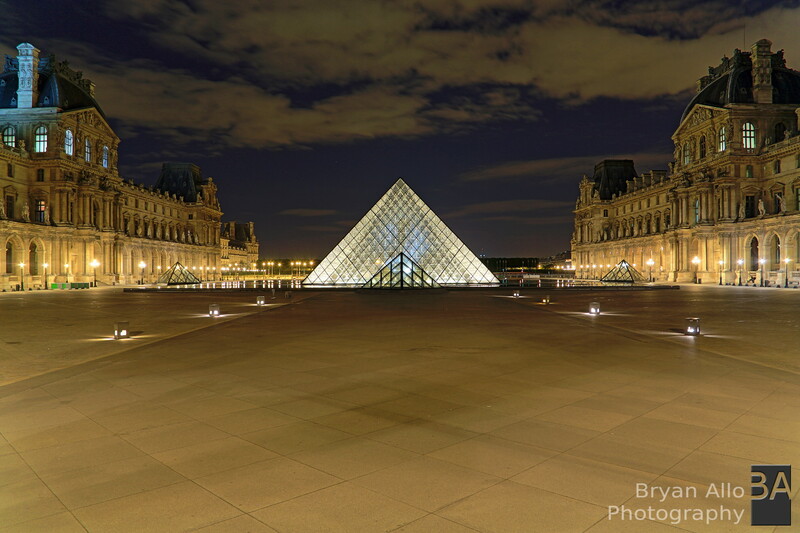 I visited the Louvre until about 3:00 am. Here is my final shot before I left. I used in-camera HDR bracketing on the 5D Mark III. No Post processing other than re-sampling the image which would otherwise be too big to post. This shot will also be available for print, as soon as I can take it through final processing and proofing. Here is a panoramic shot of the courtyard I took upon arriving. This is a panoramic composition of standard extended exposure shots. There has been slight contrast and saturation boost. It has also been greatly down sampled as the original panoramic would be too big to publish on here. This shot will also be made available for print. This is perhaps my favorite from this evening. Also a panoramic composition of in-camera HDR bracketed shots. I was very satisfied with the 5D Mark-III’s ability to generate high fidelity HDR compositions in-camera and on the fly. This better helped me to adjust my bracket shot settings. The high dynamic range of it’s sensor gives me even more flexibility when processing the RAW files. 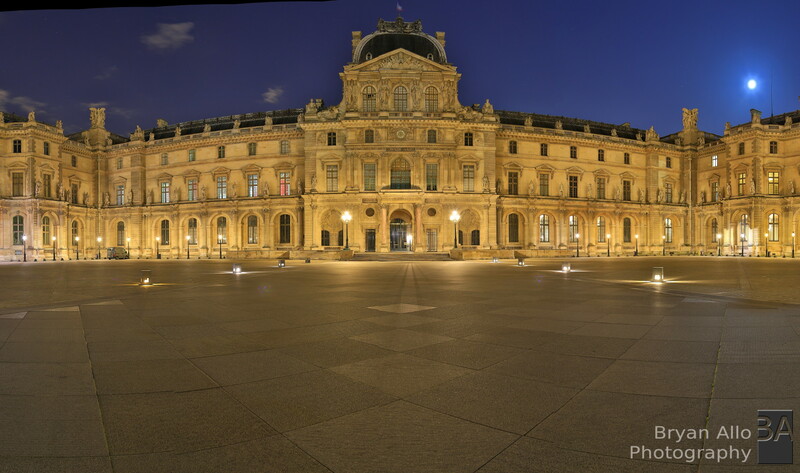 This is a quick hand held HDR panoramic I took upon arriving at the Louvre earlier in the day. As you can see, the entire courtyard was chock-full of tourists and visitors standing in lines that went on for days. From this point I pretty much concluded I was not going to bother getting any shots on the Louvre. Here is another cool HDR panoramic of the right wing on my approach to the Louvre. I loved the dramatic cloud cover over Paris on this day.